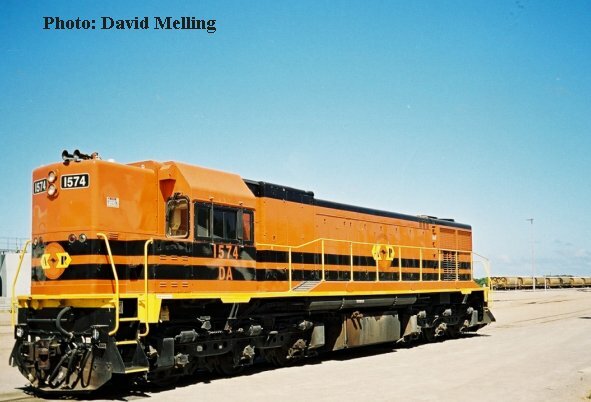 The first six months of 2003 has seen train workings in the Geraldton area dominated by grain trains working "out of zone", primarily between theGeraldton district to the Perth metropolitan area. 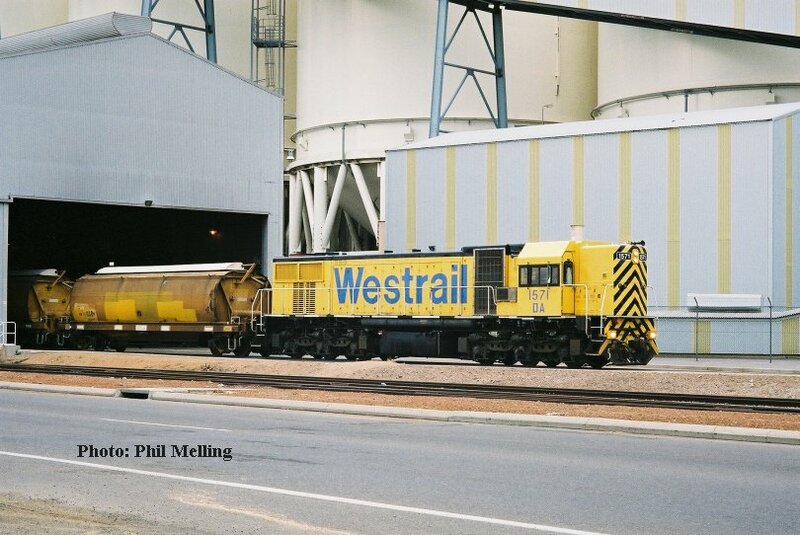 This is in contrast to workings previously that saw grain trains working from the districts grain bins to Geraldton Port. For us it has meant quite a different range of locomotives working into the area as these photos show together with different loco combinations. 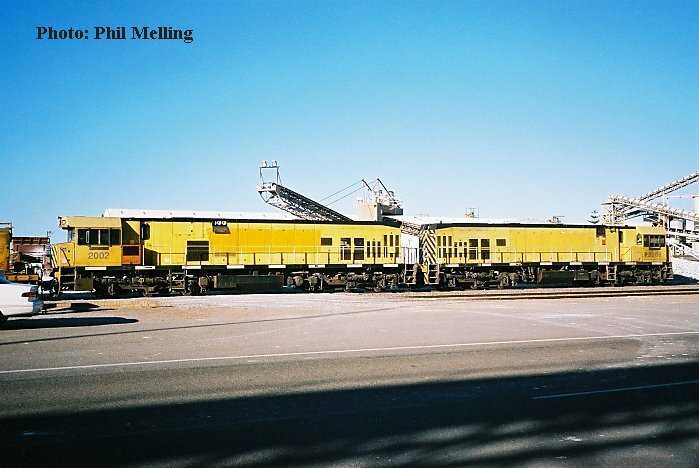 DA1571 loads grain at Geraldton Port on 24 June 2003. In the more recent past DA1571 was normally rostered for the Cairn Hill (North of Moora) Quartz train so was a different visitor to Geraldton. Not only has there been a number of different locomotives been operating in the district there has also been a number of previously unseen wagon types as this photo shows with a mix of the newer XT type (with AWR logos) and the older XU & XV types. Photo taken Geraldton Port. 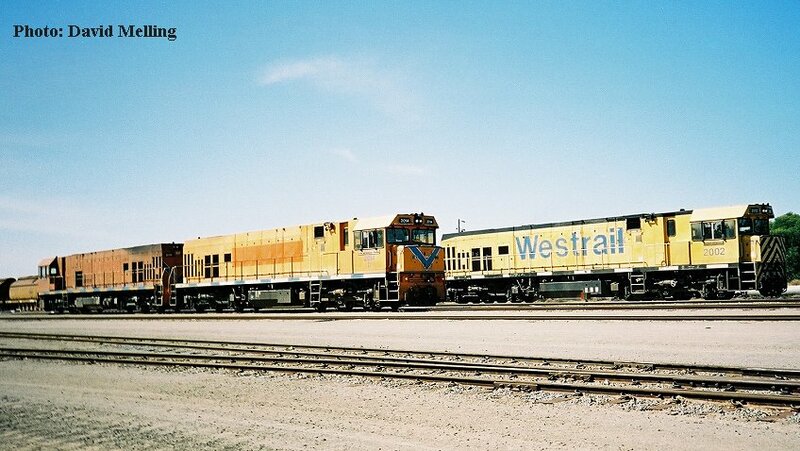 Two of the three yellow liveried P class 2008 & 2002 at Geraldton Port on 29 April 2003. 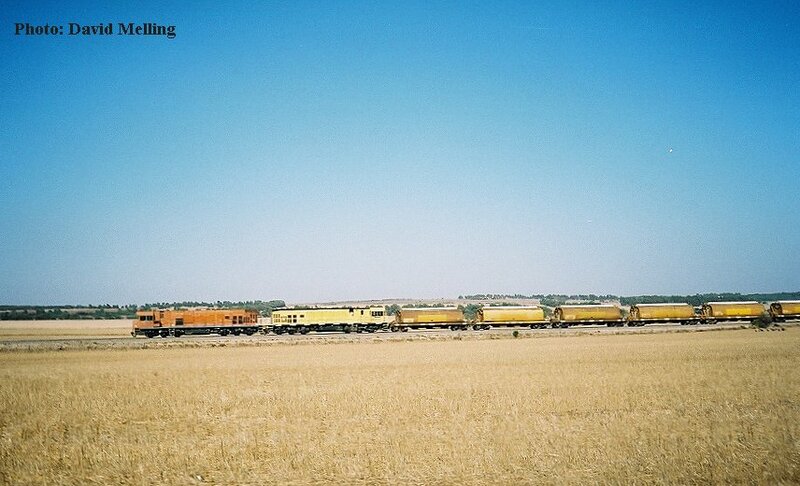 P2003&P2008 North of Dongara with a empty grain train from Perth. The Photo was taken on the 23rd of February 2003. 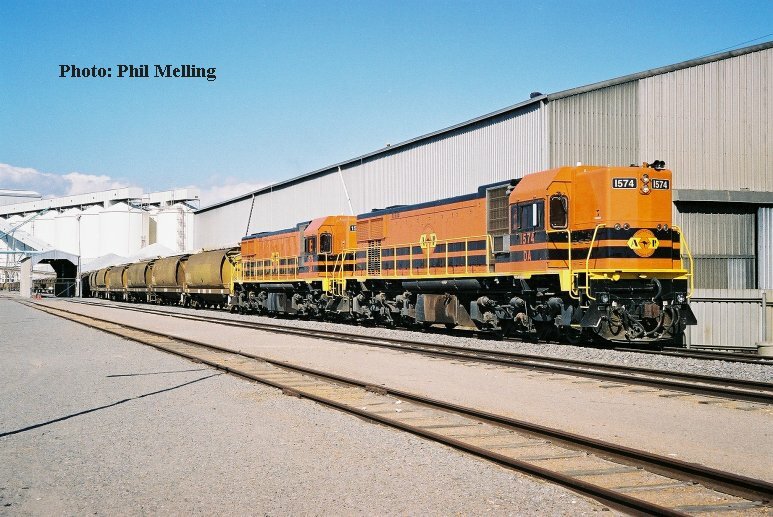 With (at that time) the only two ARG liveried DA class in the Geraldton district the hoped for happened in that the pair were put together on a train loading grain at Geraldton Port. 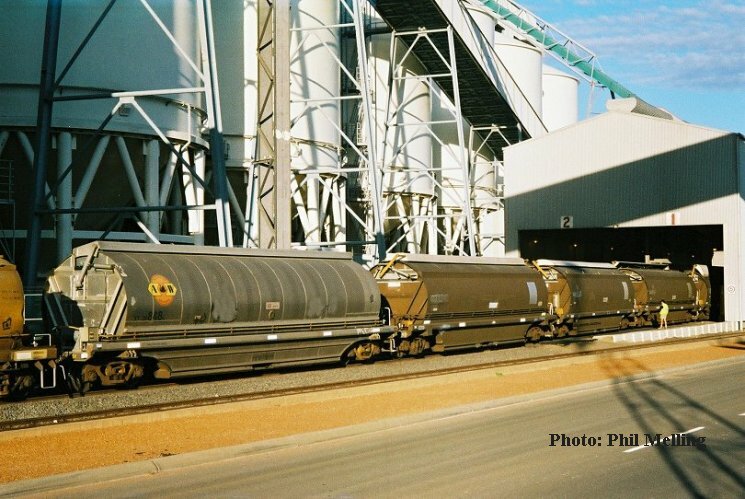 Loading grain at the Port has been a regular event in the first 4 months of 2003, the grain being railed to the Perth Metro area. This view was taken on 1 April 2003. WMD51s & WMD16x on the back of the coal train with P2008 hauling it. The WMD's had recently come out of overhual. The photo was taken on the 12th of January 2003. 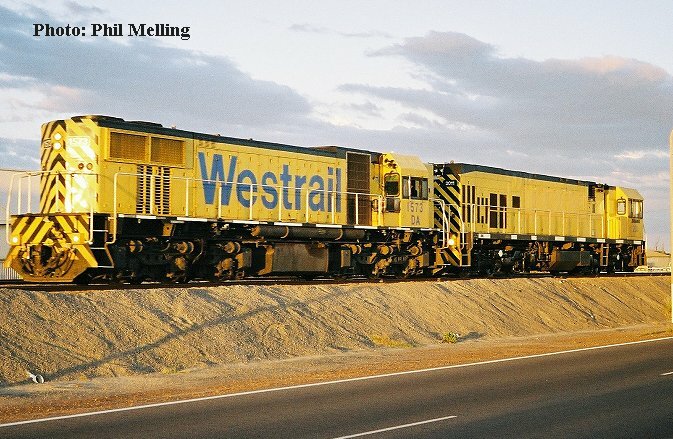 A week later on the 8 April 2003, the yellow combination of DA1573/ P2011 are seen running around a grain train at Geraldton Port in the early morning light. This was the first recorded sighting of 1573 in Geraldton since it was repainted a few years ago. P2014&P2007 with P2002 passing by on the coal train getting ready to go to the Synthetic Rutile Plant. The Photo was taken on the 26th of January 2003. 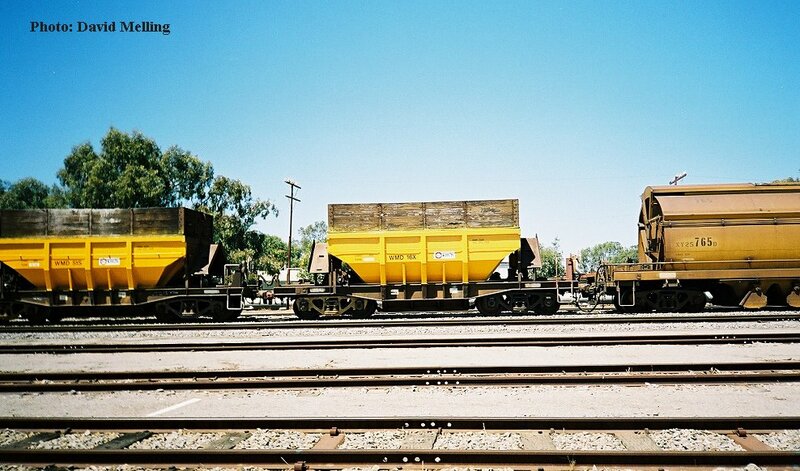 DA1574 stabled at Narngulu on the 5th of January 2003 .